It seems as though the Fall ingredients and soup trend continues over here. It’s not that I want to overload you with squashes and harvest fruit, buy it’s that I just can’t help myself. This tortilla soup has become an instant favorite at my house. It’s got sweet, treatment roasted butternut squash and shredded chicken simmered in a chili powder-spiked broth with crumbled, salty blue corn tortilla chips. I’m such a sucker for anything sweet, spicy and salty. 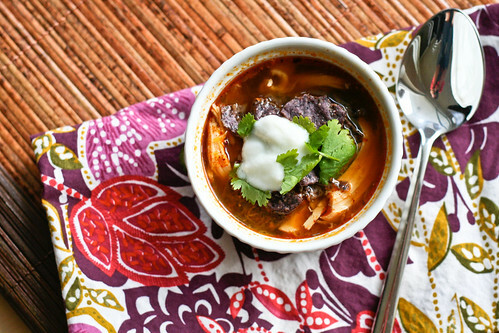 I like my butternut squash in all forms, but this tortilla soup might emerge as the favorite. Healthy, hearty and satisfying, it makes a perfect lunch or weeknight dinner. A great, seasonal twist on a classically delicious soup. Set a large pot over medium heat and add the stock, chili powder and chicken. Scoop the roasted squash out of its skin and mush with the back of a fork, then add to the pot. Once the liquid comes to a slow bubble, reduce the heat to low and simmer for 20 minutes. Remove from heat and stir in the lime zest and juice and the crumbled tortilla chips. Serve immediately and top with more tortilla chips, a dollop of plain yogurt or sour cream and a hefty sprinkling of cilantro leaves. Makes 4 dinner-sized portions or 6-8 small servings. *Preheat the oven to 375°. Place the squash halves on a lined cookie sheet. Drizzle with olive oil (about 1 tbsp.) and sprinkle with salt (about 1 tbsp.). Pop in the oven for 1 – 1.5 hours, or until the flesh is tender all the way through. This looks delicious. I just blogged about Ina Garten’s Mexican Chicken Soup and it was out of this world. I would have never thought butternut squash would go with the flavors but it sounds interesting! I never would have thought of this combination. Sounds fantastic! This is quite the butternut squash soup. Quite a departure from the “regular” butternut squash soup, so I’m hoping to give it a try. Thanks! Holy Mole batman does that look good! Healthy too! I think I am going to make it this weekend. Thanks for the good idea. This looks great, and it’s a really interesting take on a very popular recipe. Do you think it would freeze well? Fearless Kitchen – It would freeze very well! Just don’t add any of the tortilla chips, cilantro or sour cream until you thaw it out. Roasted butternut squash would go really well in this soup. i love the addition of the squash, very unexpected! This soup is incredibly good! I used acorn squash instead, because it’s what I had, and added some green onions. I don’t like sweet squash recipes, so this was a great savory preparation. I’m a novice soup maker. I found your recipe & tried it. Delicious! We had a soup contest at work today, and guess who won! Thanks!!! Best soup ever! I just made it last night and left out the lime (I didnt have any at home). This soup is amazingly good, hearty and flavorful! Thank you for combining my favorite flavors. I put half an avocado in my bowl with the low fat sour cream and it was amazing! Tried this recipe out today and added ground chicken instead of cubed and a little cumin and crushed red pepper. Outa this world!! Definitely going in the monkey chow portion on my site and passing it on to everyone who will listen. Thanks for sharing!